Where can I learn more about SHIELD tablet K1? SHIELD tablet K1 information can be found here: https://www.nvidia.com/en-us/shield/tablet. Where can I purchase SHIELD tablet K1? We’re no longer producing new SHIELD tablet K1s. SHIELD tablets will continue to receive software updates as we explore our tablet options. IN WHAT REGIONS IS THE SHIELD TABLET K1 AVAILABLE? The SHIELD tablet K1 will be available in many countries worldwide. It's initially available in the North America and European regions. WHAT COMES PRELOADED ON THE SHIELD TABLET K1? WHAT ARE THE SYSTEM REQUIREMENTS FOR GEFORCE NOW? HOW DO I MOVE APP AND GAME PROGRAM (APK + OBB) FILES FROM THE SHIELD TABLET K1'S INTERNAL STORAGE TO THE MICROSD CARD? The SHIELD tablet K1 only supports writing to FAT32 and NTFS formatted cards. 64 GB (or higher) microSD cards – Android does not support the exFAT file system out-of-the-box. Because the standard FAT32 file system does NOT support partitions greater than 32 GB by default, 64 GB cards come pre-formatted as exFAT. If you want to use a 64 GB microSD with the SHIELD tablet K1, it has to be converted to a file system format that is supported by stock Android, which in this case is NTFS. This can be done using a PC. WHY DO YOU CALL THE SHIELD TABLET K1 THE ULTIMATE TABLET FOR GAMERS? WHAT CONTROLLERS ARE COMPATIBLE WITH THE SHIELD TABLET K1? 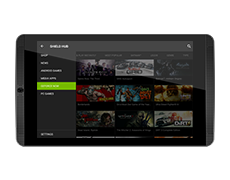 NVIDIA recommends the SHIELD controller for the ultimate gaming experience. It was designed to work perfectly and seamlessly with SHIELD tablet K1. WHAT ACCESSORIES ARE AVAILABLE FOR THE SHIELD TABLET K1? There are four accessories available at launch—the SHIELD controller, SHIELD tablet K1 cover, SHIELD world charger, and SHIELD DirectStylus 2. The SHIELD tablet K1 cover provides protection for the display as well as different viewing angles using the integrated magnets that work in unison with the body of the tablet. The SHIELD world charger includes five swappable international plugs to power your SHIELD tablet K1 anywhere you go. We also have a stylus available. All accessories are available for purchase from NVIDIA at shield.nvidia.com/store. WHAT USB DEVICES ARE SUPPORTED ON THE SHIELD TABLET K1? The SHIELD tablet K1 supports a variety of USB devices, including headphones, speakers, keyboard, mouse, and connection to other devices such as a PC for file transfer. While other USB power adapters 'might' work, we encourage you to use the official SHIELD world charger, as it both optimizes how quickly your device can charge and ensures that no damage can be done by over-charging. WHAT IS THE AUDIO OUTPUT OF THE SHIELD TABLET K1? Two front-facing stereo speakers with a wide frequency range, and two unique bass reflex ports deliver bass response unmatched by any tablet on the market. At the heart of the SHIELD tablet K1's audio excellence is the NVIDIA PureAudio™ technology that extends the frequency range to provide deeper lows and crisper highs. The 3.5 mm headphone jack supports a microphone and stereo headphone combo. For cinema experience, SHIELD tablet K1 also supports audio over HDMI. WHAT IS THE SHIELD TABLET K1'S WARRANTY PERIOD? HOW DO I UPDATE THE SHIELD TABLET K1? This is a simple process. All software updates for the SHIELD tablet K1 are directly pushed out by NVIDIA. You'll see a notification when an update is available. Once you confirm, the system will automatically download and apply the update when you have sufficient battery life.